Our team has developed general-purpose L2 networking called GEO Protocol (GEO == Global Economics Overlay), that is blockchain-agnostic, is able to process payments/transfers in different accounting units (equivalents), has fast and predictable routing and is secured via quantum-resistant crypto. During the EthBerlin we implemented first one connector for the GEO Node to the Ethereum ecosystem, and performed first multi-asset atomic payment between Eth. ecosystem and raw GEO network. The connector is responsible for mirroring node's state to the Eth. network (via contract). The connector itself is implemented as efficient state channel with ability to perform several operations in the same time in both directions. Also, please, check real-live demo (access rules are descried in the main repo). Oh, common! We provide low-level protocol solution. Bi-directional fast non-lockable state-channel for the eth, that supports efficient, and predictable assets exchange with ethereum network. Tiny, but strong and predictable communicator for GEO node, that is able to mirror node's states to the Eth. network. 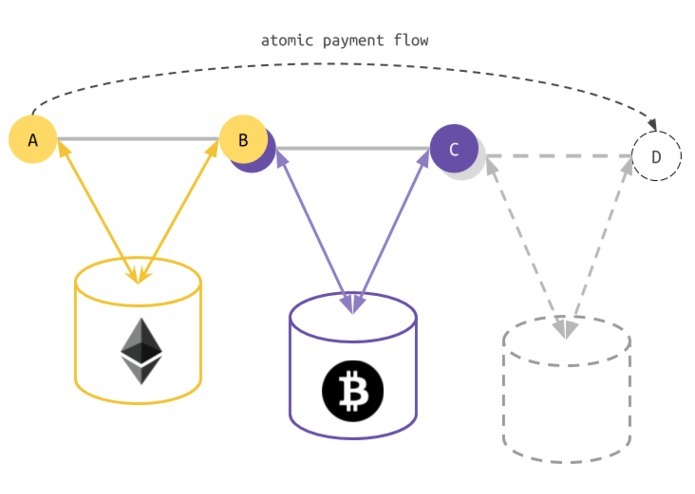 Ability to perform fast p2p payments between up to several hundreds of participants involved into one operation, in atomic and time predictable manner. The next goal is to add ERC20 support and to create also a BTC-connector and to perform maybe first eth<->btc atomic payment through L2 network.